The Content Specialist assists in the development and implementation of web content on the websites. The most common duties listed in the job description template include some or all of the following tasks – coordinating and integrating writers work, helping the designers in producing effective final layout, collecting and producing website materials, maintaining and improving quality information to the audience, ensuring that the content published is in accordance with standard rules and regulations, modifying content and supervising the workflow of junior writers. Summary : 13+ years of experience as Content Specialist, managing and creating content that provides an enjoyable, useful and intuitive user, having creative expertise including web coding, QA, design, writing, editing, content management, marketing and also accumulated expertise in standard office operations and procedures. Skills : Jira, Microsoft, Sharepoint, Visio, Microsoft Office, Adobe Acrobat, GitHub, Teamwork, Verbal Communication, Written Communication, Adobe Photoshop, iMovie, Sitecore.net, Google Analytics, And Salesforce.com. 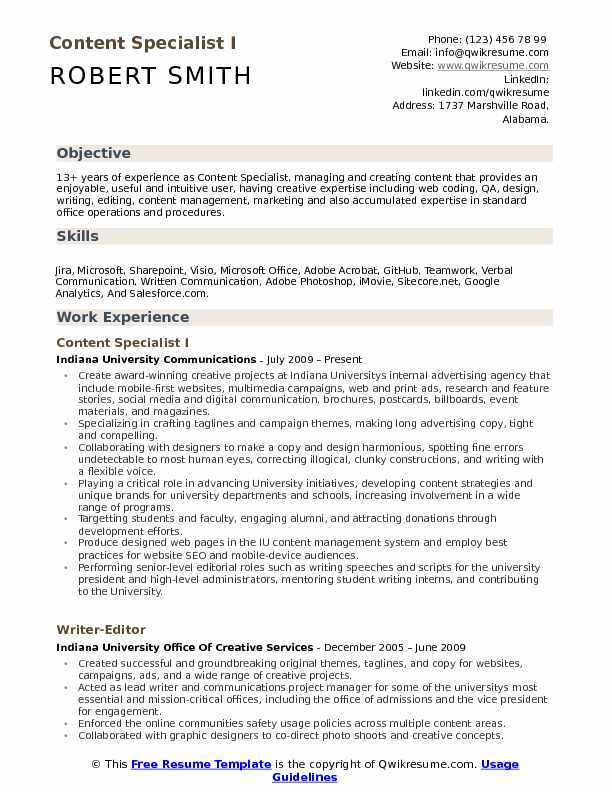 Create award-winning creative projects at Indiana University's internal advertising agency that include mobile-first websites, multimedia campaigns, web and print ads, research and feature stories, social media and digital communication, brochures, postcards, billboards, event materials, and magazines. Specializing in crafting taglines and campaign themes, making long advertising copy, tight and compelling. Collaborating with designers to make a copy and design harmonious, spotting fine errors undetectable to most human eyes, correcting illogical, clunky constructions, and writing with a flexible voice. Playing a critical role in advancing University initiatives, developing content strategies and unique brands for university departments and schools, increasing involvement in a wide range of programs. Targetting students and faculty, engaging alumni, and attracting donations through development efforts. Produce designed web pages in the IU content management system and employ best practices for website SEO and mobile-device audiences. Performing senior-level editorial roles such as writing speeches and scripts for the university president and high-level administrators, mentoring student writing interns, and contributing to the University. Design and create communications strategies, campaign themes, company brands, press, and media. Objective : 3+ years of experience as a Content Specialist is seeking to work with an organization that will utilize my creative skills to effectively devise and execute content development strategies via digital marketing. Skills : Digital campaign, Digital Marketing, SEO, Project Management, Social Media Marketing, Copywriting, And Blogging. Serving as an in-house consultant providing social media support to marketing teams. Creating social media campaigns to support brand initiatives of each marketing team. Writing copy for social media posts, digital ads, and website to help in establishing a brand voice. Managing relationships between agencies and in-house brand managers to fulfill digital requests. Conducting live social media viewings at various company events to incite social media engagement. Run paid ads on Facebook, Instagram platforms to reach campaign objectives upload and tag videos on foster farms youtube channel. Successfully doubled the followers of the Foster Farms twitter brand page on a $0 budget. Increased number of foster farms Instagram followers by over 500% on a $0 budget. Tripled number of Foster Farms Pinterest followers within the first year. 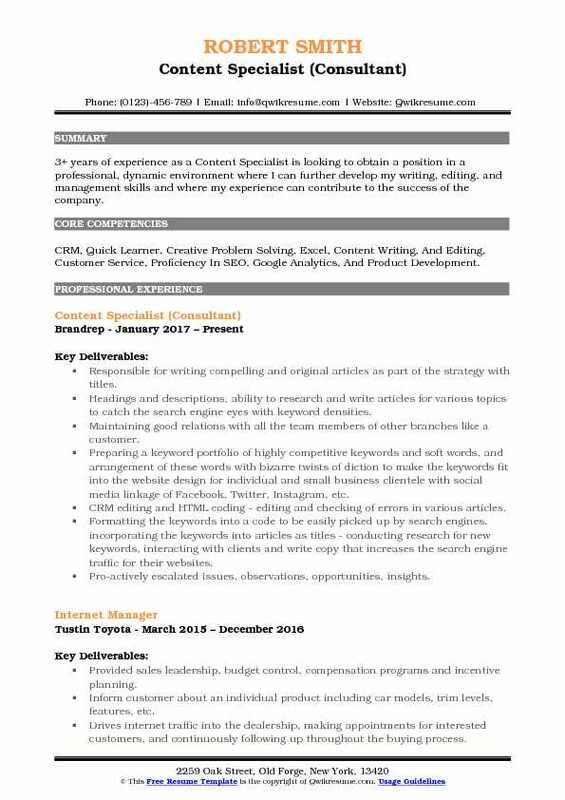 Objective : 2 years of experience as a Content Specialist is looking forward to securing a position with a strong employer that offers room for advancement. Skills : Graphic Design, Writing, Project Management, Social Media, Cascade, Content Management, Content Management System, Dreamweaver, And HTML5. Wrote and managed content, copywriting, and communications for healthcare it medical software company through the website, PR, newsletters, notifications, social media, surveys, email campaigns, and phone messages. Provided copywriting and project management for marketing and sales to facilitate print and digital advertising, and MailChimp email marketing campaigns. Wrote and managed the delivery of press releases for new acquisitions, rebrand, and new product launches, as well as external client and internal communication notifications. Focusing on SEO, wrote new website content. Updated and maintained website content, using WordPress. Launched a new mobile product by writing and coordinating pr, social media, email campaign, and print. Contributed to company rebrand by creating branded internal and customer-facing documents, promotional materials, and outdoor signage. Updated website and social media. Ensured consistent brand messaging. Wrote, edited, produced and distributed digital monthly newsletters to clients, improving the company's brand recognition and expertise in the medical industry, and promoting webinars and revenue-generating services. 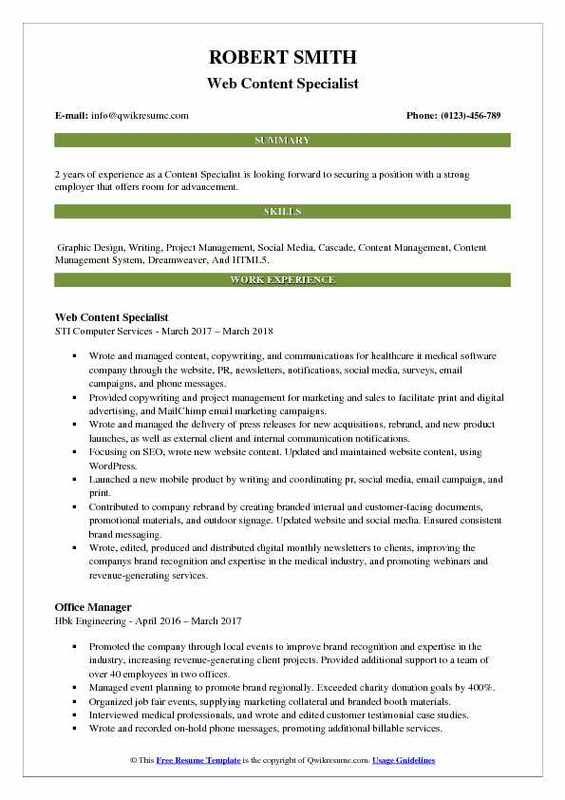 Summary : 7+ years of experience as a Content Specialist is now seeking to use my education, experience, and passion for the communications field to create impactful content through the use of words, images, video, and design. 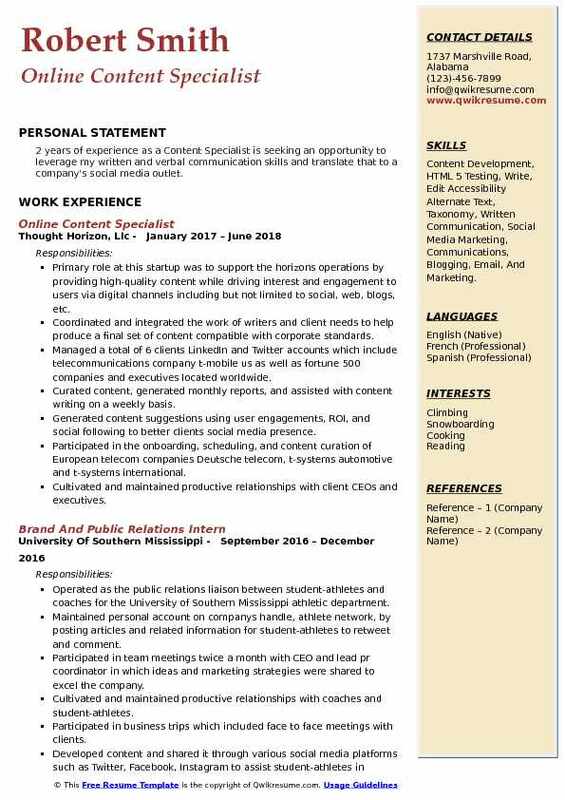 Skills : Teamwork, Verbal Communication, Written Communication, Adobe Photoshop, iMovie, Sitecore.net, Google Analytics, Salesforce.com, Wordpress.com, Microsoft Office, AP Style Guidelines, Interaction, Project Management, Software Configuration Management, And Indesign. Providing direct administrative support to colleagues in education public programs by assisting with program outreach and promotion via lacma.org and monthly mailed publications. Developing and managing all aspects of adult and college audience public programs. Reviewing and editing all galley proofs of membership publications and targeted email blasts to the general public and members. Research, write and edit content for various exhibitions and the museums' permanent collection for lacma.org, LACMAs mobile app, and LACMAs blog, unframed review and edit various art exhibition content for a general, non-specialist audience. Performing visitor observations and data compilation using charts and graphs that are shared with various departments, as well as LACMAs CEO. 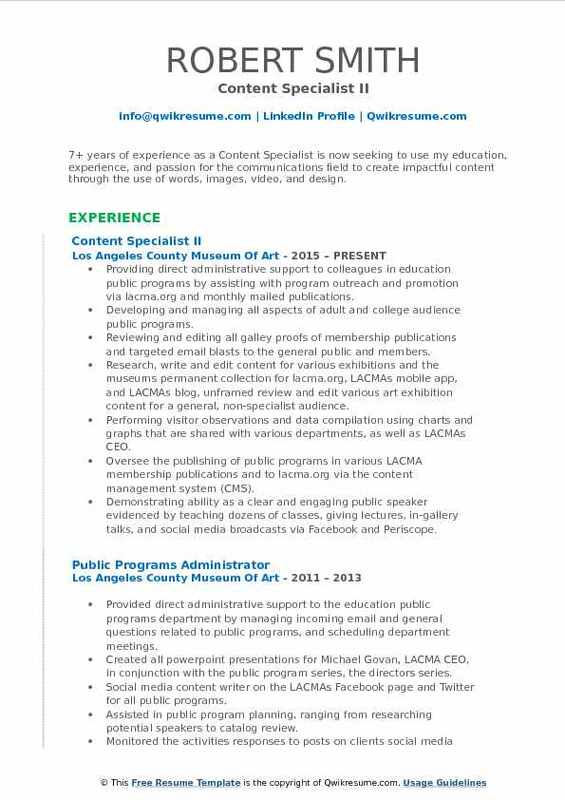 Oversee the publishing of public programs in various LACMA membership publications and to lacma.org via the content management system (CMS). Demonstrating ability as a clear and engaging public speaker evidenced by teaching dozens of classes, giving lectures, in-gallery talks, and social media broadcasts via Facebook and Periscope. Objective : Over the past 5 years of experience as a Content Specialist, I've worked to build successful Digital Marketing strategies with a focus on Search Engine Optimization and Writing, Editing, and Publishing Content. Skills : Microsoft Office, Photoshop, InDesign, Lightroom, Publishing, Writing, Editing, Copywriting, Analyzing, Reporting, And SEO Tools. Researching, planning, writing, editing, distributing, managing, analyzing and monitoring content from pre-production to post-production in the form of articles, landing pages, case studies, blog posts, guest posts, resource pages, evergreen content, and social media content. Researching and prospecting for link building opportunities for clients. Performing email outreach to influencers, bloggers, publications, and the media to build quality links and increase customer engagement for clients. Performing ongoing keyword discovery and expansion in coordination with client business objectives to optimize existing content and unveil new opportunities. On-page and off-page SEO techniques including competitive analysis, keyword research, content creation and link building. Optimization for client sem accounts to ensure traffic and ROI goals are met. Leverage SEO tools such as MOZ, SEM, Rush, Majestic SEO, Ahrefs, and others to perform Seo. Analyze performance of SEO optimizations and make additional recommendations to improve rankings and quality of traffic. Started off as a part-time content specialist to a full-time outreach and content editor and manager. Link building, outreach, content creation, keyword research, content analysis, competitor backlink analysis, tracking, reporting, post-production of content. 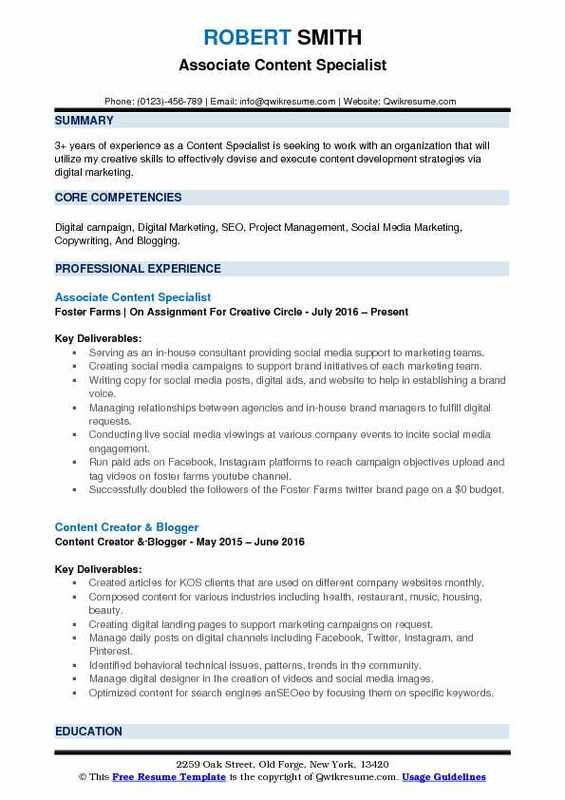 Objective : 3 years of experience as a Content Specialist is seeking to obtain a position with a reputable organization, that flourishes on professional growth from within, where I can utilize my knowledge in digital content management to accomplish your organization digital marketing goals. Skills : Cascade, Content Management, Content Management System, Dreamweaver, HTML5, Microsoft Office, Google Docs, and Spredfast. Responsible for managing and building relationships with key stakeholder sources for the purpose of collecting information on public and private construction projects. Manages projects in all phases of the construction project life cycle, from planning through the post-bid phase. Involves telephone conversations, internet research, document management and data entry. Established productive business relationships with owners, engineers, architects, Reprographers. Conducted telephone calls to assigned sources to obtain updated project information along with documented plans and specifications. Created and update private and public project reports in the pre-design, design, bid and post bid stages of the construction process based on information obtained from the sources, including general contractors. Worked closely with Reprographers to coordinate the delivery and processing of plans, specifications, and other important documents. Prepared check requests for document fees and/ or deposits per content protocol. Per research and documentation, closely analyzed if there were any new updates issued to each project. Responded to email and voicemails in a timely manner according to content protocol. Objective : 3+ years of experience as a Content Specialist is an organized and creative professional with a positive, energetic approach, proven skills, and a desire to learn more and lead a successful career in communication and marketing. 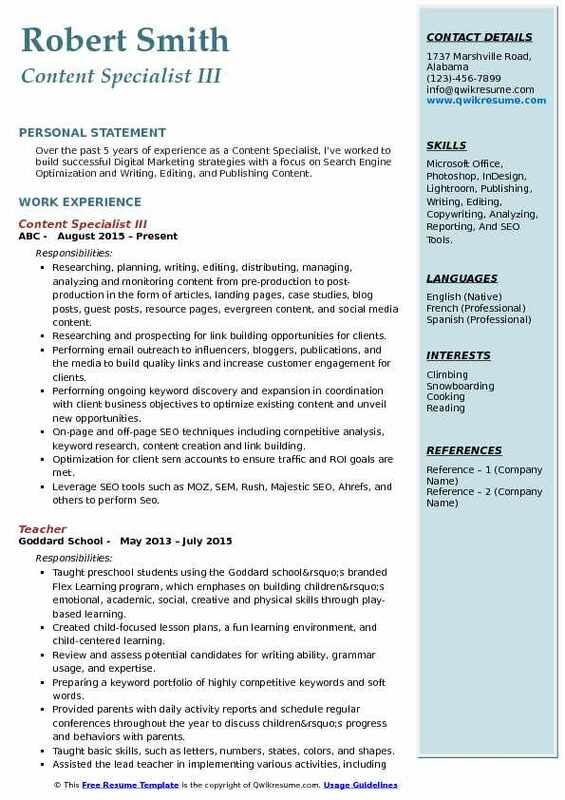 Skills : Content Creation, Copy Writing, Media Relations, Clerk, Excel, InDesign, MS Office, And PowerPoint. Write weekly blogs for both one-click ventures e-commerce eyewear brands (readers.com and sunglass warehouse) based. Work to keep company emails, policy pages, blogs, and web copy on the brand. Working with the marketing team on rebranding our sunglass warehouse brand. Leading Snapchat marketing experiment, creating "geo-filters" for sunglass warehouse and dropping them over targeted. Monitoring Googlegle analytics to track and capitalize on blogs that gain the most engagement. Create video script for one clicks brackets for good partnership video with Timmy global health. Copywriting for product inserts for both readers.com and sunglass warehouse brands. 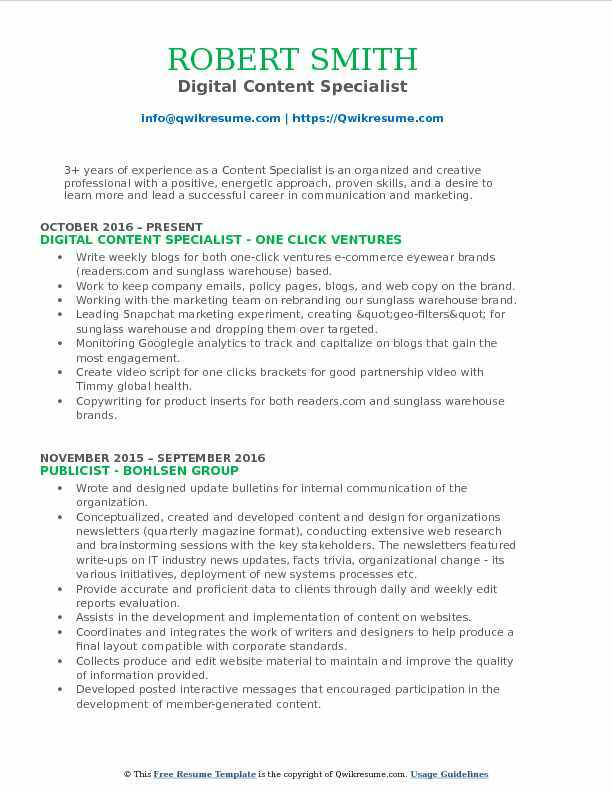 Objective : 3+ years of experience as a Content Specialist is looking to obtain a position in a professional, dynamic environment where I can further develop my writing, editing, and management skills and where my experience can contribute to the success of the company. Skills : CRM, Quick Learner, Creative Problem Solving, Excel, Content Writing, And Editing, Customer Service, Proficiency In SEO, Google Analytics, And Product Development. Responsible for writing compelling and original articles as part of the strategy with titles. Headings and descriptions, ability to research and write articles for various topics to catch the search engine eyes with keyword densities. Maintaining good relations with all the team members of other branches like a customer. Preparing a keyword portfolio of highly competitive keywords and soft words, and arrangement of these words with bizarre twists of diction to make the keywords fit into the website design for individual and small business clientele with social media linkage of Facebook, Twitter, Instagram, etc. CRM editing and HTML coding - editing and checking of errors in various articles. Formatting the keywords into a code to be easily picked up by search engines, incorporating the keywords into articles as titles - conducting research for new keywords, interacting with clients and write copy that increases the search engine traffic for their websites. Pro-actively escalated issues, observations, opportunities, insights. 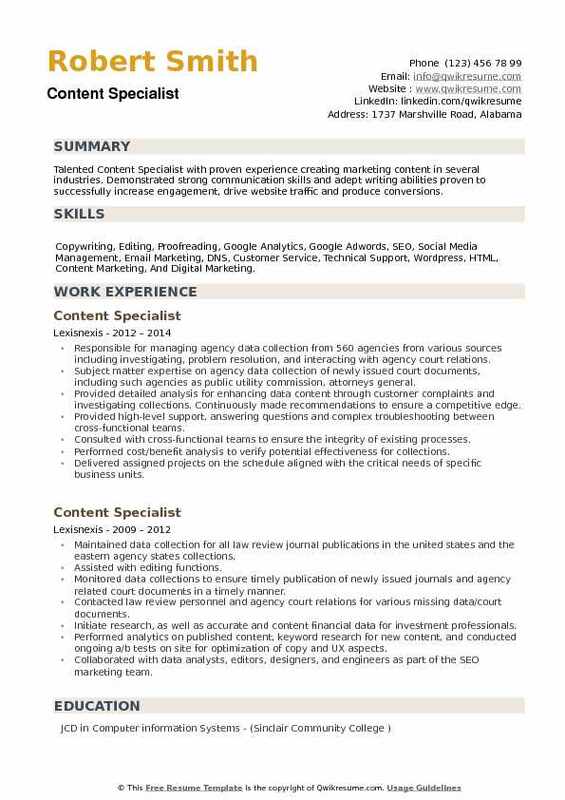 Objective : 2 years of experience as a Content Specialist is seeking an opportunity to leverage my written and verbal communication skills and translate that to a company's social media outlet. Skills : Content Development, HTML 5 Testing, Write, Edit Accessibility Alternate Text, Taxonomy, Written Communication, Social Media Marketing, Communications, Blogging, Email, And Marketing. Primary role at this startup was to support the horizons operations by providing high-quality content while driving interest and engagement to users via digital channels including but not limited to social, web, blogs, etc. Coordinated and integrated the work of writers and client needs to help produce a final set of content compatible with corporate standards. Managed a total of 6 clients LinkedIn and Twitter accounts which include telecommunications company t-mobile us as well as fortune 500 companies and executives located worldwide. Curated content, generated monthly reports, and assisted with content writing on a weekly basis. Generated content suggestions using user engagements, ROI, and social following to better clients social media presence. Participated in the onboarding, scheduling, and content curation of European telecom companies Deutsche telecom, t-systems automotive and t-systems international. Cultivated and maintained productive relationships with client CEOs and executives. Participated in business trips which included face to face meetings with clients. 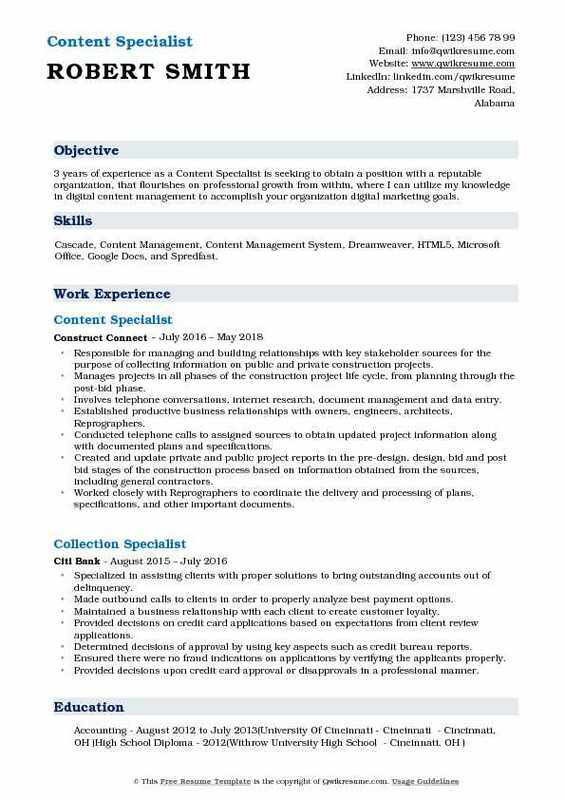 Objective : Talented Content Specialist with proven experience creating marketing content in several industries. Demonstrated strong communication skills and adept writing abilities proven to successfully increase engagement, drive website traffic and produce conversions. Skills : Copywriting, Editing, Proofreading, Google Analytics, Google Adwords, SEO, Social Media Management, Email Marketing, DNS, Customer Service, Technical Support, Wordpress, HTML, Content Marketing, And Digital Marketing. Responsible for managing agency data collection from 560 agencies from various sources including investigating, problem resolution, and interacting with agency court relations. Subject matter expertise on agency data collection of newly issued court documents, including such agencies as public utility commission, attorneys general. Provided detailed analysis for enhancing data content through customer complaints and investigating collections. Continuously made recommendations to ensure a competitive edge. Provided high-level support, answering questions and complex troubleshooting between cross-functional teams. Consulted with cross-functional teams to ensure the integrity of existing processes. Performed cost/benefit analysis to verify potential effectiveness for collections. Delivered assigned projects on the schedule aligned with the critical needs of specific business units. Routinely monitored and updated current collection grids, making sure modified/new collections are working properly. Investigated exclude/duplicate report for possible broken collections.